An antiquarian or antiquary is one concerned with antiquities or things of the past. Also, and most often in modern usage, an antiquarian is a person who deals with or collects rare and ancient "antiquarian books". More narrowly, the term is often used for those who studied history with special attention to "antiques", meaning ancient objects of art or science as physical traces of the past. 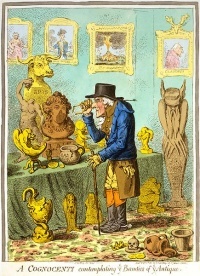 Antiquarianism is usually considered to have emerged in the Middle Ages (see History of archaeology). By the 19th century, it had become transformed and bifurcated into the academic disciplines of archaeology and philology. Unless indicated otherwise, the text in this article is either based on Wikipedia article "Antiquarian" or another language Wikipedia page thereof used under the terms of the GNU Free Documentation License; or on original research by Jahsonic and friends. See Art and Popular Culture's copyright notice. This page was last modified 21:32, 21 May 2015.